Nicola Setari discusses the issues surrounding the work he did for Visionary Africa and his collaboration with architect David Adjaye on GEO-Graphics. The presentation focuses on the itinerancy of Visionary Africa in different African capitals and on the many questions surrounding the representation of African culture within contemporary European institutions. Setari discusses the controversial notion of cultural restitution between European and African countries as well as the politics of working with existing ethnographic collections in Europe. Nicola Setari, researcher, curator, editor, and professor of visual anthropology at the Milan New Fine Arts and Design Academy. He was an agent of dOCUMENTA (13) in Kassel, Germany, contributing to the artistic and educational programme. 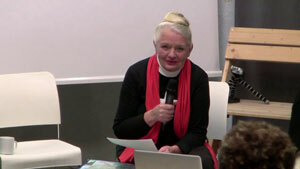 He also co-edited part of the dOCUMENTA (13) catalogue – The Logbook (2012). Between 2006 and 2009, he was editor-in-chief and publisher of the cross-disciplinary art magazine Janus. In 2010 and 2011, he was co-curator of the Visionary Africa platform for the Centre for Fine Arts in Brussels and co-editor of David Adjaye’s GEO-Graphics: A Map of Art Practices in Africa, Past and Present (2010).